Nobody likes having to deal with electronics piles of wires. We are slowly shifting to a wireless era. We now even have wireless charging of devices and wireless streaming is something so common that it present in almost every home. One of the popular means of streaming music wirelessly is using a Bluetooth soundbar. Soundbars are stepping forward to replace the old home theater systems. 5.1 speaker systems are becoming obsolete mainly because they are not practical anymore. There are too many wires to deal with, unnecessary speakers and technological limitations. Also, you do not need a large subwoofer to enjoy a bit of bass when listening to music. Bluetooth soundbars have become increasingly popular over the past few years. A lot of people are ditching their old systems in order to easily stream music from their smartphones. Usually, a soundbar is made out of a single, long speaker that contains multiple smaller drivers. They have a built-in amplifier and only need to be connected to a power source. 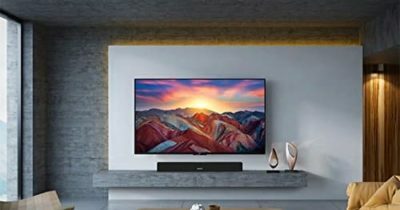 If needed, some soundbars also offer the option to be connected to an input using a digital audio cable or regular auxiliary cable but this tends to vary from one model to another. Also, the setup of these sound systems can vary a bit. Some models do not have a subwoofer but have a decent bass while others may have a subwoofer. It all depends on what drivers were used and what the manufacturers had in mind when designing the speakers. With all that cleared up, let’s have a quick look at our recommendation for the top 10 best Bluetooth soundbars in 2019. The Daktronics wireless soundbar is a great choice for the ones that are on a tight budget. It is a 34 inch 2 channel speaker that can be used as a home theater on its own. As the name states, the speaker works wirelessly via Bluetooth. It can stream music from mobile devices but it can also be connected to an optical cable, coaxial or RCA AUX input to a sound source. 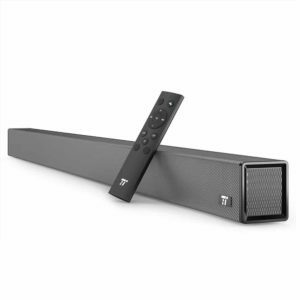 The soundbar includes a dedicated remote and can be mounted on to a wall. Megacra wireless soundbar is a good addon for any TV. It sounds so much better than the built-in speakers. 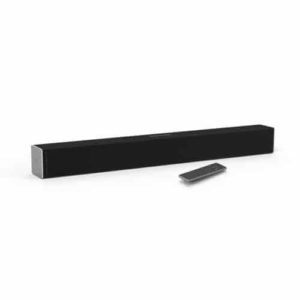 The model is a simple soundbar with an output of 40 watts and a 2.0 channel setup. It includes a small remote and supports audio streaming over Bluetooth. The DSP technology used does offer decent sound quality and the bass is quite decent but what makes it such an attractive pick is the low price tag. Samsung HW-M360 is a great pick for the ones that are looking for a complete home theater replacement. It is a 2.1 channel system that comes with a soundbar and a subwoofer. Both the soundbar and the subwoofer work wirelessly and do not need to be connected to each other using a cable. The system also works with any Bluetooth compatible device for audio streaming or it can be connected to an audio source using an AUX cable. The overall sound quality of the system is quite decent and powerful enough even for a large living room. Richsound Research TB220L is a good solution for the ones that are looking for an upgrade for their TV’s built-in speakers. 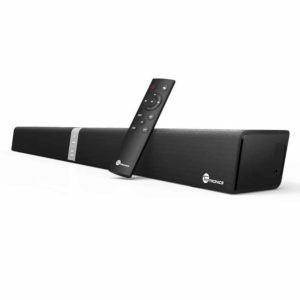 It is a cheap but decent soundbar with an output of 16 watts which is enough for a small room. The sound quality is decent and it even delivers a bit of bass. Like most other soundbars, the model supports Bluetooth music streaming, an optical input connection, and AUX. 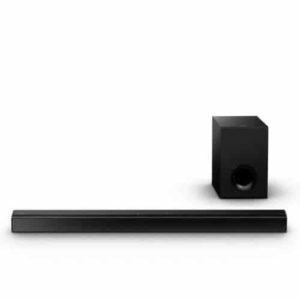 The soundbar is also wall mountable and has a very sleek and modern design. 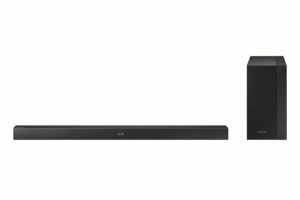 Sony HT-CT80 soundbar is a great pick for pretty much anyone that is looking for a great deal. For such an inexpensive system it offers great sound especially since it has a dedicated subwoofer. The system has an output of 80 watts and the subwoofer and soundbar work wirelessly with each other. Bluetooth and NFC are supported as expected but it also allows for analog inputs or Digital Optical audio. The model does not come with a remote but once set up there is no need for one. The fact that the system does not come with a remote is one thing but it also means that there is no way to adjust bass and treble. Sony does not offer this option for this version at least which means that they can only be adjusted from the source if the source allows bass and treble to be adjusted. Bose Solo 5 is one of the more expensive models but the brand has a great reputation in terms of sound quality. The soundbar is capable of delivering mids, highs and a good amount of bass. It was designed to be used with a TV or a mobile device using Bluetooth. The included remote offers all the required controls and makes it very easy to set up. Like most of their other speakers, the Solo 5 can be expanded by adding more Bose speakers. Bose sounds systems tend to be very expensive. Not everyone is willing to spend this much on just a soundbar. 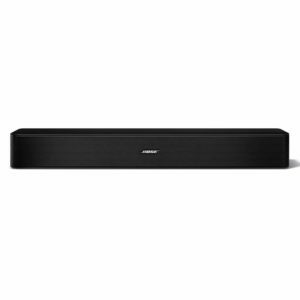 Adding up the fact that more speakers can be added and those cost a lot as well, the Bose soundbar will prove to be an option only for the ones that do not mind spending extra in order to get premium sound quality. Pyle made a rather powerful soundbar that does not cost all that much. For the price, the sound system offers an output of 300 watts. 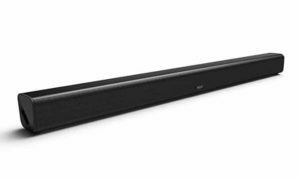 Even if it is a soundbar, it is a 5.1 channel system and has a built-in subwoofer which means good sound quality and powerful bass. The system includes a small remote that makes it easy to swap between outputs and supports Bluetooth devices. Last but not least, the system can be connected to a TV and it is wall mountable. These days, most TVs and sound systems have the optical output. For some odd reason, Pyle decided not to add an optical audio input for the soundbar. This means that a lot of TVs will not work with this model. It is better to check the connectivity options before purchasing this particular soundbar. 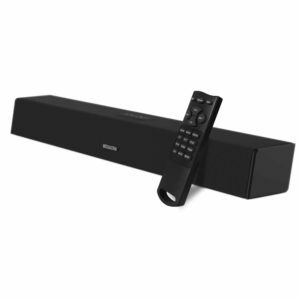 The AmazonBasics 2.1 channel Bluetooth soundbar offers excellent value for money like most of the products from Amazon. It is a loudspeaker system that delivers great quality mids and highs as well as a bit of bass with the aid of the built-in subwoofer. The model supports audio streaming over Bluetooth from all compatible devices or it can be connected to a TV or media player using a wired connection. The unit does include a remote control and it includes all the hardware required to mount it onto a wall. The sound system works quite well, especially for a living room. It is not great for listening music as they are not that powerful. The sound system was made mostly to be used for a TV and not for music. It is still a great pick for the ones that are looking for a great deal. The VIZIO SB2920 is a great pick for the ones that are looking for a steal deal. It is an inexpensive sound system that is pretty loud and offers decent fidelity. Unlike other models in the same price range, the model has DTS Studio Sound, DTS TruSurround and DTS Tru Volume which helps improve sound quality. Setup is fairly straightforward and as expected, it supports streaming over Bluetooth. Last but not least, the system comes with a small remote and offers a good amount of sound tweaking options. The remote control is not very intuitive. Some would be tempted to say that it is not very easy to setup but that is where the user manual comes in. The user manual does a very good job at explaining everything and takes only a few minutes to understand how to properly use the remote. TaoTronics wireless soundbar is a great pick that offers pretty much everyone someone would expect from a soundbar. The system is quite powerful and has a built-in subwoofer that delivers excellent bass. It covers the full audio spectrum and can be used for both TV and music. The slim design makes it look very modern. As expected it supports both a wired input and wireless streaming over Bluetooth. The model includes a small remote to control all its functions and settings and can be mounted on a wall. The remote included has all the functions and buttons to gain full control over the system. If there is one thing that could have been improved is the latency of the remote. The soundbar tends to pick up the signal from the remote with a bit of lag. The thing that most will notice when it comes to soundbars is that they tend to look almost identical. Everyone uses the exact same design with some minor cosmetic changes. The biggest difference is what they used inside. This means the quality of the drivers and how well the sound is processed. These things are difficult to estimate at first but there are some other important things to look out for. Here are some pointers on what makes each soundbar different. Power: The driver’s users and the amplification determine how loud the soundbar really is. Not everyone needs a very loud soundbar for a TV or to listen to music. With or without a subwoofer: When it comes to subwoofers, there are two types of soundbars. There are soundbars that have a separate subwoofer and some that have it built-in. There are even some that do not have a subwoofer an all. With or without a remote: The remote is optional and not all systems have one. In all honesty, having one more remote to handle can be annoying. The ones that do want it with a remote, there are plenty of models to choose from. Also, models with remotes, make it easier to setup the soundbar.